Ruth Sabina Hinshaw1,2 [Sabina Hinshaw1]. Born Jun 7 18451,2,3,4,5,6,7 [about 18478], Cherry Grove MM, Randolph County, Indiana1,2,3,4,5,6,7. Russell, William, age 27, born in Indiana; teacher of Select School; $1200 real estate; $300 personal property. Russell, Ruth S., age 23, born in Indiana; keeping house. Young, William, age 20, born in Arkansas; teacher of Select School; attended school. Hinshaw, Jennie, age 17, born in Indiana; attended school. Russell, William, age 38, born in Indiana; father born in Indiana; mother born in Virginia; teacher. Russell, Ruth S., wife, age 35, born in Indiana; parents born in North Carolina; keeping house. Arnold, Lillie K., domestic, age 13, born in Indiana; parents born in Indiana; attended school. Anderson, Henry, employee, age 30, born in Indiana; father born in Indiana; mother born in Tennessee; widower. Russell, John, brother, age 31, born in Indiana; father born in Indiana; mother born in Virginia; single; carpenter. William Russell, head-of-household, age 57, born July 1842 in Indiana; father born in North Carolina; mother born in Virginia; married 32 years; occupation: farmer; owned farm (mortgaged). Ruth S. Russell, wife, age 54, born June 1845 in Indiana; parents born in North Carolina; married 32 years; 3 children, none living. Rockhill, Inez, servant, age 24, born March 1876 in Indiana; parents born in Indiana; widow; 1 child, none living; occupation: house work. Renney [unclear], Noah, boarder, age 32, born May 1868 in Ohio; parents born in Ohio; married 10 years; occupation: lawyer. Russell, William, head-of-household, age 68, born in Indiana; father born in North Carolina; mother born in Virginia; first marriage, married 42 years; occupation: merchant, grocery store; owned home (free). Russell, Ruth, wife, age 65, born in Indiana; parents born in North Carolina; first marriage, married 42 years; 3 children, none living. Fennell, Emily, servant, age 59, born in Georgia; parents born in Georgia; widow; 5 children, 1 living; occupation: servant, private family. Ruth Sabina Russell was born in Randolph county, Ind., on June 7, 1845 and died May 9, 1914, lacking only a few days of being 69 years old. She was married to Wm. Russell on August 13, 1868. Three children were born to them but died in infancy. 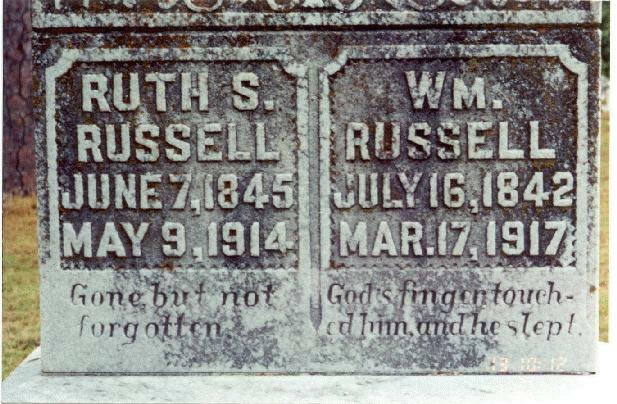 Mrs. Russell is survived by her husband and one brother, Rev. Wm. Hinshaw of Burton, Kansas, who spent about a week visiting his only suster. He returned to his home only two days before she passed away. Mrs. Russell was a Christian lady and was strictly faithful in what she conceived to be right, no matter whether the thing was popular or unpopular. Mrs. Russell was a natural born teacher and leader, teaching her first school when but sixteen years old. She was at home in the school room, Sabbath school or church. In the early days of temperance work, Mrs. Russell presided over County and District Conventions and often led on the definite results. She plead with the drinker and with the saloon keeper face to face in his saloon and engage in a business more productive to the good of human race. Her bible was her daily companion, from which she derived much comfort and spiritual strength. She prayed in public and in secret and her prayers were an inspiration to those who heard them. She was a kind wife, a good neighbor and a blessing to every community in which her lot was cast. She was postmistress of Southland for nearly 17 years. Having no children of her own, she often had orphan children in her home to rear and train. She passed peacefully into the arms of her trusted Savior. A few hours before her death her husband repeated a part of the 23 Psalm, "Though I walk through the Valley and Shadow of Death, I fear no Evil," leaving out the clause "for thou art with me." She quickly supplied the clause "for thou art with me" showing her faith in a present Savior even when the throes of death were stealing over her. May her virtues be cherished and imitated by those of us who are left to mourn her loss. Contribution from Mary Norton Canaan (). 1880 census, Marion Township, Grant County, Indiana; roll T9-280, ED 180, page 657C, line #1, dwelling #59, family #63. 1900 census, Cleburne Township, Phillips County, Arkansas; roll T623-71, ED 74, page 15A, line #1, dwelling #249, family #254. 1910 census, Cleburne Township, Phillips County, Arkansas; roll T624-60, ED 95, page 146A, line #13, dwelling #4, family #4. 1870 census, Marion P.O., Marion Township, Grant County, Indiana; roll M593-317, page 25, line #10, dwelling #156, family #174. Contribution from Mary Joanne Norton-Canaan (). Photo courtesy of Mary Norton Canaan ().